LNG – A Catalyst for Development or Inequality in Papua New Guinea? In March 2018, I was invited by the University of Melbourne to present a paper on Uneven Capital Flows at the Conference on New Geographies of Global Inequalities and Social Justice. It was an inter-disciplinary conference aimed at generating new knowledge about enduring and emerging forms of inequality and injustice, and contribute to public debate on how these can be addressed. 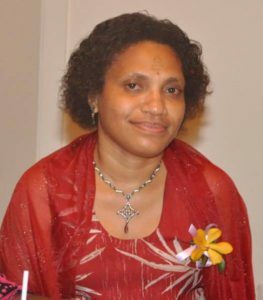 My paper is a continuation of my earlier blog articles about injustice and inequalities in PNG, particularly in the resource sector where massive amounts of wealth is transferred from Papua New Guineans to foreign multi-national companies and a few group of people in the project footprints. I also present my analysis of why I think the resource curse has plagued PNG. I pray that my post is read with an open mind so we can engage in good debates about the inequality of wealth and opportunity in PNG, a land blessed with abundance of natural wealth, and find solutions. The advent of the nascent LNG industry has heralded yet another false dawn for Papua New Guinea. The gas riches have not materialized as envisaged and the policy framework of the current Papua New Guinea Government is myopic and entrenches further the inequality of opportunity and wealth within Papua New Guinea. The public institutions, such as the Sovereign Wealth Fund, to safeguard non-renewable mineral resources are yet to be fully established leading to grave fears that the future opportunity to advance the development agenda could once again be squandered. The PNG Government has seemingly backed itself into a corner and despite the evidence that its policies are not delivering better outcomes seems helpless to change course and adopt a more equitable, people-focused approach to policy formulation and implementation. I argue that this is driven by a poor governance framework and a government leadership desperate to cling to power. Things may get worse before they get better, something that long-suffering Papua New Guineans cannot afford. The commencement of the PNG LNG Project was a truly remarkable achievement by the Government of Sir Michael Somare and one that was desperately needed to spur growth directly and to provide much needed government funding to support the development agenda of Papua New Guinea (“PNG”). The fanfare associated with the PNG LNG Project was also one of false optimism. I started writing on economic injustice in Papua New Guinea during my unsuccessful bid for the Papua New Guinea National Parliament. This term of PNG’s National Parliament has, sadly, no female Parliamentarians. It highlights the political inequality that we have, even though more than half the population is female. My writing focused not so much on a particular political perspective but simple analysis that revealed inequity and unfairness – or redistribution from certain groups to others and particularly the Government. This paper summarizes those analyses and provides an update a year on from any progress made on these issues. I stress that I am not an academic and this merely provides insights. My basic hypothesis is that the large PNG LNG Project has driven the Government into a false sense of economic security. This has led to elevated levels of public spending and budget deficits but with little to show for it on the ground. Instead the ruinous budget policies are resulting in a great economic injustice to the people of PNG. As I have only limited time so I will focus on a handful of these. The LNG project commenced early works in mid-2009 with full project construction kicking off early the following year. LNG production started in April 2014. So what did the PNG LNG Project promise for PNG? 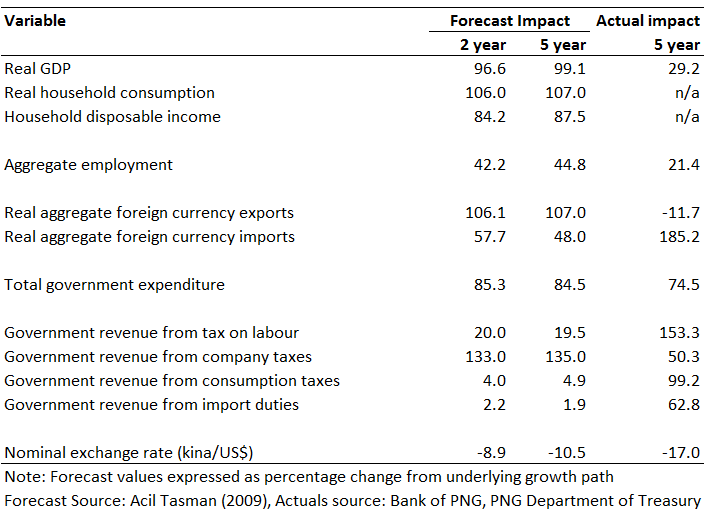 In a report commissioned by PNG LNG, economic modelling indicated the following impacts (shown in Table 1) (Acil Tasman 2009). These are quite extraordinary impacts. Table 1 shows 2-year impacts, which the report calls short-run impacts and the impact after 5-years, which are long-run impacts. Apparently by comparing the 5-year impact with the 2-year impact you can see which impacts are transitory and which impacts persist. The modelling using computable general equilibrium model, which I have no expertise in, forecasted a real GDP increase from end-2008 over 5 years by 99.1 percent – a remarkable doubling of PNG’s national income in half-a-decade. It predicted household income to increase by 87.5% and consumption to also grow by 107%. Aggregate employment was to have increased by 50%. Whilst government spending was to increase by 84.5% over the 5-year period, this would be more than offset by increases in company taxes (which includes mineral and petroleum taxes) by 135%. Does PNG suffer from the Resource Curse? PNG is classified by the International Monetary Fund as a resource rich economy as 20% of its exports are derived from non-renewable natural resources. So are the non-renewable resources of PNG more a curse than a blessing. In PNG’s recent history, the PNG LNG Project provides a start example of how an abundance of non-renewable natural resources has imparted quite a dramatic impact on economic and budget outcomes with not all of these have been good. In Table 1 for the selected variables I extracted from the PNG LNG Project’s economic modelling of the impact I also show in the last column the actual outcome. There are varied differences, which to be fair is to be expected from a modelling exercise. Over the modelled period 2009-2013, instead of a doubling of the real economy it only grew by 33%. Employment in aggregate only grew by 21.4%, half of what was forecast. The nominal exchange rate appreciated even more strongly than forecast confirming fears that the Dutch disease could manifest in PNG. Different categories of taxes were expected to increase from the model baseline by different amounts. Personal income tax was to increase by around 20% but actually grew by an astonishing 153%. There was to be only a modest increase in our GST of 5% but instead it doubled. Import duties were to grow by 2% but actually grew by 63%. Finally, where most of the gains from the project were to be captured for PNG in company taxes, a forecast growth of 135% only achieved a damp growth of 50%. The PNG Government has tried its best to ensure that the model projection of public spending increase of 84.5% was achieved and only just fell short reaching an increase of 75% but it wasn’t for want of trying. Within this mixed bag of outcomes as some poignant narratives that emerge. Truly the resource curse has manifested itself in PNG as a result of the PNG LNG Project. Unlike perhaps other similar economies, the PNG Government didn’t even wait for the revenue streams from the resource project to arrive but instead mortgaged the future of our children in anticipation of large cash flows. I want to explore very quickly some of the issues that Table 1 points to that I believe as a consequence of the gigantic gas project. The narrative is a simple one. 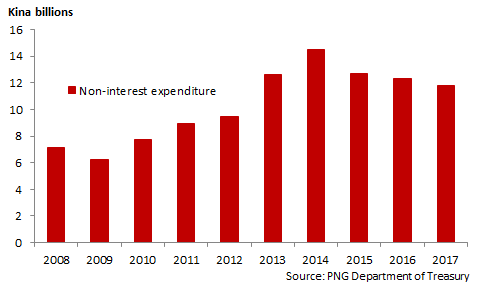 Large capital flows have come into PNG to fund the development cost of a huge gas project. The project promises much rewards for the gas exploitation that will seemingly set PNG on the path to future posterity. The PNG Government under Sir Michael Somare granted a raft of fiscal concessions to the project to get it off the ground. The succeeding and current O’Neill Government in anticipation of this embarks on a spending and investment spree before the revenues are realized. In the meantime gas prices tank falling by nearly 50% in 2014. The oil price shock not only reduces the profitability of the gas project and reduces public revenue but is a terms of trade shock for PNG. The terms of trade shock is usually offset by an adjusting movement in the nominal exchange rate but instead we see that the PNG central bank locks in an exchange rate and without demand for imports and foreign currency falling, at the same time starts rationing foreign exchange. This leads to a tax on growth as imported intermediate goods necessary for production and other consumption items are unable to be brought into the country leads to falling sales. We also observe that the Government is unable to restrain public expenditure and instead resorts to financing of the budget by the Central Bank. This exerts considerable pressure on the exchange rate setting up a vicious circle. As I stated earlier the exchange rate is not only fixed but foreign exchange is rationed. As businesses suffer, so public revenue falls without any real offset in public spending. The deficit is financed by the Central Bank. This in turns imparts further pressure on the exchange rate and you can see how we are back at the start of merry-go-round though there’s no mirth and glee here. Against this backdrop the Government makes some peculiar policy choices that penalizes ordinary Papua New Guineans. Let me quickly return to the Government’s fiscal position. 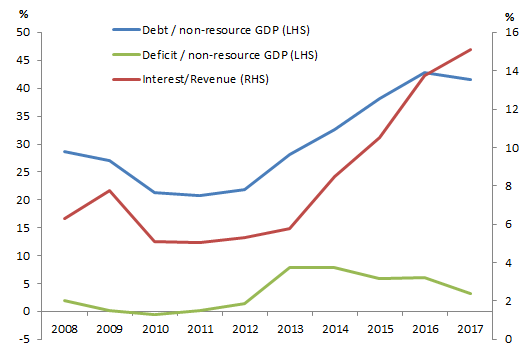 From Figure 1, we see that public debt has exploded over recent years, driven principally by a growing budget deficit. This has led to increasing interest cost which now accounts for 15% of government revenue. Funding for essential goods and services is now being squeezed. This can be seen more clearly in Figure 2 where non-interest spending has started to fall in recent years in absolute terms. This fall is even greater if considered on a per person basis. The biggest driver of the fiscal imbalance that has emerged is the mismatch between the promises of increased public revenue from the gas project and actual receipts. 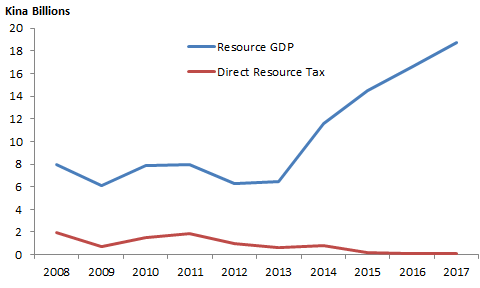 Whilst resource GDP (or the income of mineral and petroleum) has taken off, we see in Figure 3 that direct resource taxes (or mineral and petroleum corporate income tax) has actually declined to levels close to zero over the last 3 years. I note that in Australia there is a Senate inquiry being conducted on the taxes paid by the resource sector. I led the technical team that conducted the last tax review for PNG and we made recommendations to make changes to the resource rent taxes in PNG. These have been partially implemented but there is still much more that can be done. The Government has gloated about the budget deficit for 2017 hitting its fiscal target of 2.5% of GDP and made mention of the public service wage bill being brought under control in 2017 (Department of Treasury 2018). However, this merriment disguises a particularly unpleasant truth. The 2017 fiscal accounts are a sham. The PNG Government adopted a fiscal accounting standard that moves towards accrual accounting. Our public finances systems are currently configured for accounting on a cash/commitment basis. It is slowly transitioning to this new standard by first presenting the fiscal accounts using the new standard, which it first did so in 2016. Now! There are two key reasons why the reported budget deficit for 2017 is a sham. The first is that there has been a build-up of arrears to the private sector due to the ongoing cash flow difficulties of the Government. Just earlier this month as PNG struggles to deal with terrible destruction of property and lives wrought by earthquakes in the provinces where our gas and oil fields are located, staff of our National Disaster Office were locked out of its building. The office I am in is housed in the same building. Even the government agencies that control public funds, PNG Department of Finance and PNG Department of Treasury were locked out of their offices in December 2017 for significant rental arrears. Under accrual accounting, an expense is recorded when it is incurred not when cash changes hands in which case you reflect it as accounts payable. The Government has failed to record what I believe is a significant build-up of arrears for goods and services it has procured. Expenditure is thus understated and so too is the deficit for 2017. There is a second reason why the deficit is incorrect. The PNG Government is not paying its employees correctly. For instance it has not honoured the contractual agreement it made with public servants and teachers to pay a wage increase of 3% last year and this year. The public service of Papua New Guinea is the largest employer within the country. It covers both the National Government as well as our provinces. It is a highly centralized structure where decisions about personnel matters including terms and conditions are made in Waigani, Port Moresby. The wage rate increases that Government awards serve as a benchmark for the private sector and thus for wage movements through the PNG economy. In December 2016 the Government negotiated a 3% wage increase with the unions for the public service and teachers. I pointed out in my blog that with inflation running around 6 percent this was tantamount to a real wage reduction of around 3%. Whilst this in itself is quite shocking what has stunned me even more is that the negotiated increase in wages is not even being implemented by the Government. In Figure 4 you can see the for the period 2013 to 2019 annual wage rate increases for public servants and teachers compared to levels in 2013. So instead of a real decline of 3.8% for 2017, a 5.8% has been imposed. This year if the 3% increase for both last year and this year is not implemented then a real decline of 12.3% will result. To put this in perspective we can ask how this compares to Australia for example. 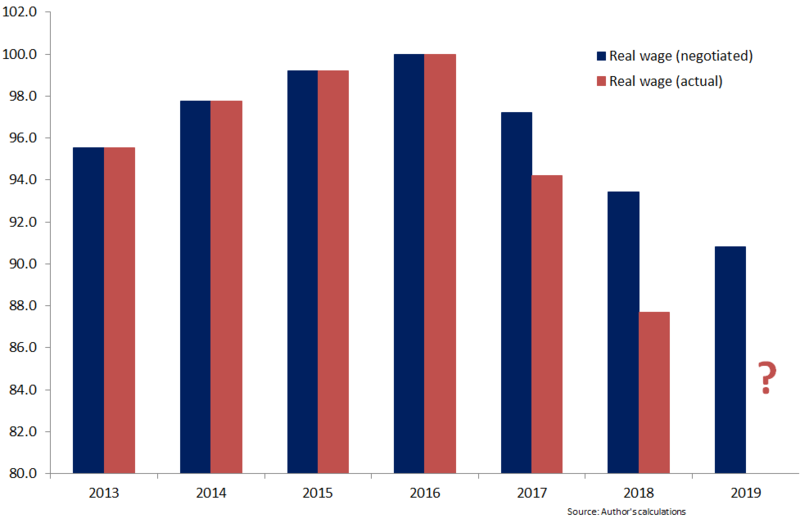 The Australian Bureau of Statistics (2018) reports that real wage growth (whether the public sector, private sector or total) has grown every quarter since 2014 (whether original, seasonally adjusted or trend). This is an austerity program in stealth and one that the front line of service delivery in PNG – teachers and public servants are being forced to bear. For a country with significant development needs I’m not sure that asking the public sector workforce to bear the pain is sensible. It will most likely lead to even poorer development outcomes. The cost of a population with low numeracy and literacy skills far exceed the cost of wage increase I estimate at around K300 million for the full wage rate increase to the end of this year. This real wage cut has the potential to undermine productivity that will be damaging to economic and social outcomes for years to come. Teachers deliver the investment in human capital formation that Papua New Guinea needs to advance development. The other significant arrear to government employees relates to superannuation employer contribution. The Government owes around K2 billion that has been outstanding for over a decade. In case you are wondering, this liability wasn’t captured in Figure 1 that I presented earlier. We have a Fiscal Responsibility Act that sets caps our debt to GDP ratio to 35%. The true level of debt exceeds this legislative target. In Table 1 I presented a comparison of taxes on labour forecasted to arise as a result of the PNG LNG and the actual outcome. Over the comparison period, the actual outcome was a staggering growth of 153.3% nearly 8 times more the predicted growth of 19.5%. This is even more extraordinary when you consider that personal income tax accounts for the largest share of government revenue – more than company tax, more than GST, indeed every other revenue category. But consider this, tax paying wage and salary earners in PNG represent only around 3-4% of the population in PNG but provide nearly 30% of public revenue. Of these taxed workers, public servants and teachers provide the largest group. So we have the unhappy circumstance that public servants and teachers are being asked to forego part of their lawfully due remuneration whilst being the largest contributing group to personal income tax. The Government has faced difficult cash-flow issue and struggles to finance its fortnightly payroll expenses. So for a Government that is cash strapped how has it managed to keep operations going? It has done so by raiding independent public companies bodies to fund the deficit. For instance, in 2016, the Government forced its holding company of public utilities, Kumul Consolidated Holdings Limited, to pay a K320 million dividend to support the budget. However, this so called dividend was financed by Kumul Consolidated Holdings by a loan from our largest bank Bank South Pacific (in which Kumul Consolidated Holdings holds about 20% equity stake). Whilst there are companies that borrow to pay dividends this typically occurs when there is optimism about the growth prospects of the company. Our public utilities have been reported to be a fiscal drag, inefficient and undercapitalized (ADB 2016). Rather than investing in these utilities, that account for around 10% of GDP and are a significant source of the high cost structure in our economy, our Government has instead sought to stymie their restructuring efforts. The second institution that has been called upon has been the central bank of Papua New Guinea – the Bank of PNG. The blatant manner in which the independence of the Bank of PNG has been completely undermined is disturbing. The enabling law of the BPNG prohibits it from paying a dividend to the Government when its net worth is negative. In the graph I show the net worth of the BPNG. For years 2013 and 2014 the BPNG recorded a negative net worth of over 0.5 billion Kina. Despite this the BPNG paid a dividend of 102 million Kina in 2014. Despite this serious breach of our law this has gone unchallenged and unpunished. The very fact that our central bank has been allowed to have deficiency in its balance sheet position is disturbing in itself. 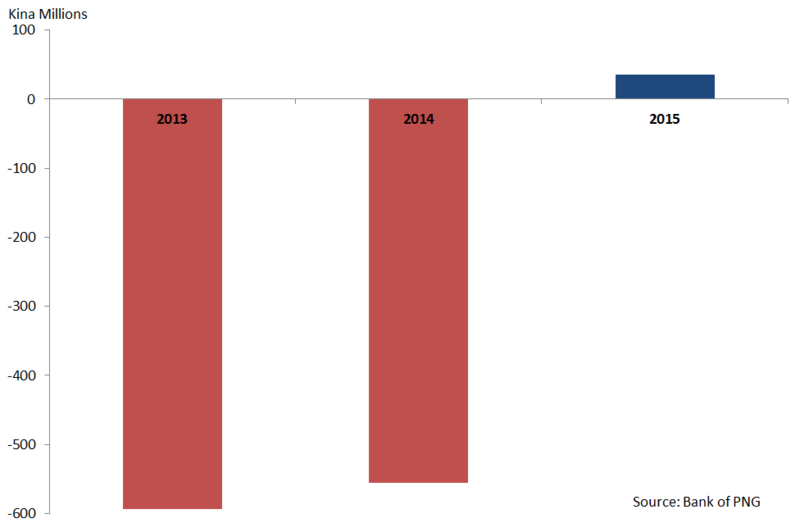 Figure 6 shows how the Bank of Papua New Guinea has bought Treasury Bills (shown in blue) and Inscribed Stock (shown in red). 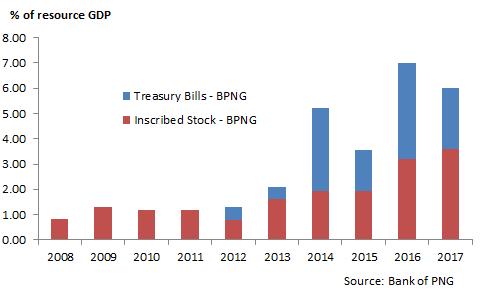 The Bank of PNG cleared its holding of Treasury Bills in 2004 and maintained this until 2012 when it then recommenced buying Treasury Bills again. Despite the huge gas project commencing there was no liquidity in the government securities market to take up the additional issuances of Government securities (Treasury Bills and Inscribed Stock) so the Bank of PNG stepped in to provide funding to the Government. The Central Banking Act states that the Bank of PNG may only purchase Treasury Bills and Inscribed Stock for the purposes of monetary policy management and is prohibited to lend more than K200 million to the Government. Rather than putting more money into the economy it should be removing the excess liquidity by selling Central Bank Bills. This seems to me further evidence of the erosion of the independence of the Bank of PNG. The Central Bank printing money to support the Government has lowered interest rates encouraged loose spending by the government leading to the debt overhang. One redistributive effect of low interest rates on government securities particularly has been to penalize savers, which in PNG is through our superannuation funds, who hold and manage the retirement income for PNG workers. The low interest rates coupled with relatively higher inflation has led at times to negative real interest rates resulting in a transfer of wealth from the workforce to the Government. Let me conclude by making some points about the fiscal regime that applies to the PNG LNG Project. The Project was granted a package of concessions including a corporate income tax rate 2% lower than it otherwise should have been. Exemptions from foreign exchange regulation were granted including scrutiny by the central bank, which now makes its task difficult when trying to understand why PNG has a shortage of foreign exchange despite large net exports. Other exemptions include zero import duty during the construction period and zero rating of GST for the project and its sub-contractors. However, I want to focus on royalty payments, which are supposed to be made to the minerals and petroleum resource owner for the right to extract their resource. In PNG, the subsoil assets, including oil, gas and minerals, belong to the State but resource project landowners and the host provinces receive the “royalties” and project development levies. Whilst a label of royalty is used, it is anything but that. Papua New Guinea does not have a true royalty system for the PNG LNG project as it is not the developers who exploit the gas resources that bears the burden of royalties but the taxpayers of Papua New Guinea. For both benefits the value is equivalent to 2% of well-head value of oil and gas extracted. Under law both royalties and development levies can be claimed as tax deductions. If, as in the PNG LNG Project, both are paid then the royalty can be claimed as a tax credit. For the PNG LNG Project, and generally, the company income tax for each project participant is determined by taking its gross income subtracting any exempt income and allowable deductions and multiplying against this against the applicable tax rate, which is 30%. If there are any tax credits this is then offset to give the income tax payable. The PNG LNG Project has secured fiscal stabilization but was not required to pay an additional company income tax rate of 2 percentage points for this as required under the Resource Contracts Fiscal Stabilization Act. That is a company income tax rate of 30% is applied though normally it would be 32% with fiscal stability. So a tax deduction delivers a tax saving for the project participants of 30 toea for each K1 of the total amount of allowable deductions whilst a tax credit delivers complete tax savings of the corresponding amount of the eligible tax credit expenses. These amounts are offset from their tax bills. Who actually bears the first round cost of these benefits that are made to those fortunate project landowners and project provinces? There is an incorrect perception in PNG that the costs of the royalty and development levy are wholly borne by the PNG LNG Project – this is not the case. bear the burden of 65% of the combined cost of the PNG LNG royalty and development levy. 75% of the State’s company that holds equity in PNG LNG. The first three have a combined value of K1.78 billion that is paid for by the tax-payers of Papua New Guinea as they were incurred prior to receipts from gas production. Project landowners and provinces also get a free carry of 2% direct project equity. This is also paid for by taxpayers. The additional equity in the State company that owns shares of PNG LNG gives them an additional indirect project equity of 4.27%. I compute using publicly available data and forecast oil prices that the value of 25.75% of the State’s company that holds shares in the PNG LNG project is US$1.4 billion. However, under the UBSA a sale price of US$1.03 billion was agreed. In the run up to the national elections in the middle of 2017 the O’Neill Government first agreed to lower the sale price from the original UBSA, this was done unilaterally and outside the statutory process. Then on the eve of the elections Prime Minister O’Neill announced that the additional UBSA equity stake would be given away for free. It is surely more than a coincidence that the main beneficiaries of the grant are from the provinces that he hails from. Under the UBSA the net value for the rest of PNG would have been US$1 billion. Under the unilateral revision the net value loss is US$783 million and then the final option now approved by the Government would see a transfer of value of US$1.4 billion to landowners in the project from the rest of PNG. This represents a particularly unfair redistribution of significant wealth to PNG LNG landowners from the rest of PNG. These landowners number around 100,000 compared to a national population estimated close to 8.5 million people. You can now see the considerable inequity especially when taxpayers have paid for this full equity stake and the landowners’ direct equity share of 2% and provided them with UBSA benefits totalling K1.78 billion and then meeting the cost of royalties and project development levies to boot. Papua New Guinea’s Constitution states in the preamble that “Our national wealth won by honest, hard work be equitable shared by all”. Our Constitution sets as the 4th Directive Principle that our natural resources be used for “the collective benefit of us all, and be replenished for the benefit of future generations”. We are seeing a transgression against our Constitution. Significant benefits are being transferred to around 1% of PNG’s population by the rest of the country. This seems inherently unjust. In closing I will focus on 4 high-level policy interventions that I feel are necessary to address the woeful state of inequity in PNG that has arisen from the resource curse. These overarching interventions then allow for more specific and directed initiatives to support more equitable and sustainable development. The first is to immediately repair the budget. This is a medium term effort but arresting the growth in non-priority expenditure is key. A quick and simple solution is to cut the slush funds of politicians euphemistically called the service improvement programs. This measure alone would reduce the expenditure budget by 7.5%. To put this in context the Stronger Communities grant scheme (the Australian equivalent of our service improvement program) which costs A$45 million is not even 0.01% of the Federal expenses budget of $464.3 billion. Secondly, to be able to implement the 4th directive of our Constitution to achieve especially inter-generational equity, PNG has to set up a Sovereign Wealth Fund (“SWF”). This mechanism will allow funds realized from the exploitation of the natural non-renewable assets to be saved and preserved whilst utilizing the returns for development objectives. PNG has been exploring the establishment of a SWF since 2009. Nearly a decade on, the SWF is nowhere to be seen. The initial momentum that was established in establishing the overarching legislative framework has all but been lost as politicians squabbled about how to design the fiscal rules for the SWF. In particular, the integrity of the Fund was undermined by an effort to redesign key features to expand the prospect of a cash grab and diminish the savings objective. I am pleased that the PNG Government introduced a new fiscal rule and embedded this within the PNG Fiscal Responsibility Act last December. This rule sets a target of non-resource primary balance equal to zero over the medium term. This is particularly important as it means that resource revenue cannot be used to fund non-resource spending and so must be saved. The only problem is that a vehicle is now needed to store and invest these resource saving – the solution operationalize the SWF. Thirdly, there needs to be a restoration of the independence of the PNG central bank so it can take the appropriate monetary policy stance and correct especially exchange rate policy. There needs to be a gradual realignment of the exchange rate to allow the pressure in the foreign exchange market to ease and to restore the competitiveness of the PNG economy. Monetary policy needs to step back from funding the budget deficit and to allow interest rates to increase to counteract the inflationary pressures that will emerge as the economy adjusts. The final solution is to get more Papua New Guinea women into positions of power, authority and influence. That needs deeper thinking to combat the deep rooted cultural biases that prevent gender equity in Papua New Guinea. I have no doubt however that it would make a substantive difference to better policy and better outcomes for Papua New Guinea. ← Natural Disasters: Have We Not Had Enough Lessons? Please permit me to share your analysis on Facebook? !